In what I can only refer to as a double-punch instance of sheer luck, it just so happens that my son is not only a fan of reading, but he is also a fan of reading about food. More specifically, he is a fan of reading about food making food, which I discovered when my son took a rather intense liking to the book Bake Sale, by Sara Varon. I can’t blame my son for falling in love with this book—it’s simply lovely. Sara Varon is the author and illustrator behind the Chicken and Cat books, two titles that rate very high in our home’s list of fine children’s literature, so it should not have come as any surprise to me that Bake Sale would be another spectacular work. Bake Sale is the story of two friends, an eggplant and a cupcake, who work together to fund a dream trip to Turkey (which I just now realized is also the name of a food, which is a detail, intended or not, I now find totally hilarious). Cupcake owns and runs a small bakery, and while he is renowned amongst a small local following for his fantastic cakes and pastries, he is not exactly swimming in enough cash to fund his Turkish vacation. Through months of hard work and clever baking ideas, Cupcake eventually saves up enough money to accompany Eggplant on his trip. Cupcake’s fundraising bake sales are presented in lively detail, with one afternoon taking him to the Westminster Dog Show to sell homemade dog biscuits, and another to a farmers market to peddle his sweet offerings of vegetable-based baked goods. 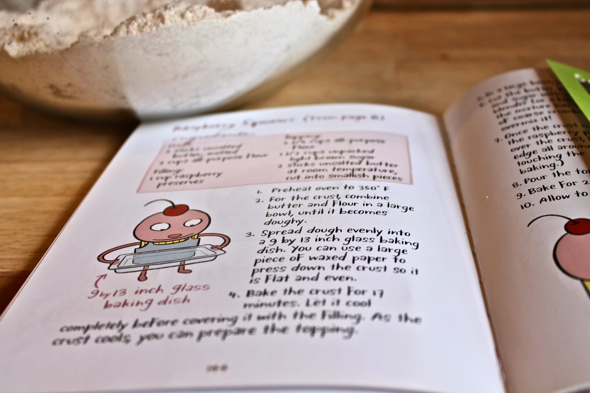 At the end of the book lies a delightful treat: A ten-page spread of recipes based on the treats showcased in the story. Peppermint brownies, vanilla cupcakes with vanilla frosting, the aforementioned homemade dog biscuits—they’re all in there, and I can speak from experience when I say that some of the recipes are incredibly delicious (I can’t speak for the dog biscuits, but the vanilla cupcakes with vanilla frosting were a delight). 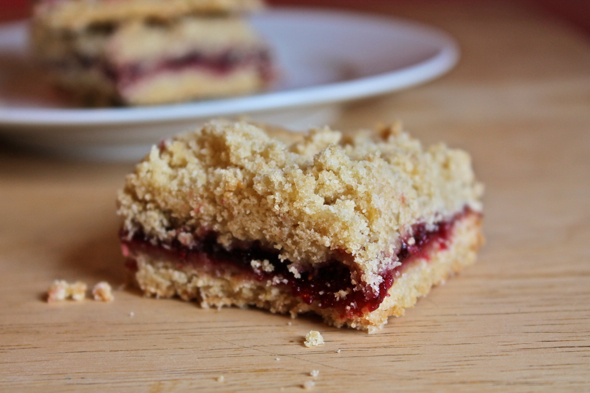 For months my son had been clamoring to make the raspberry squares featured in the book, so when we found ourselves with an open afternoon a few weeks ago, we open the book and dove right into the recipe. 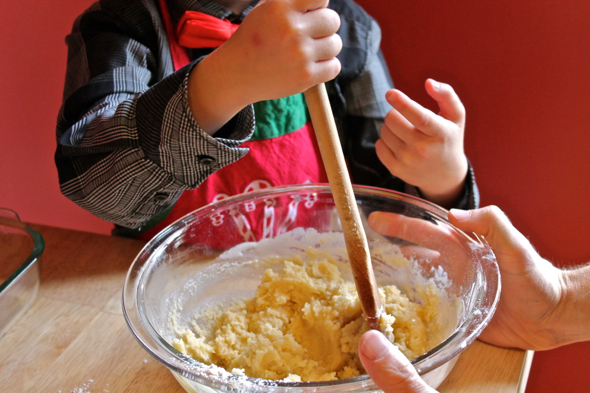 We had a great time working together as a family, my husband and son tackling the recipe itself while I stood back and took some photos. My son really wanted this project to be his, so I spent a fair amount of time out of the kitchen, purposefully keeping my prying mitts off of his work. When the dessert emerged from the oven, so beautifully golden and scented of butter, we could hardly stand to wait until the squares were cool enough to cut and eat. And then something completely unforeseen happened. The raspberry squares were terrible. I mean, they were just awful. The base was loose, greasy, and tasted of raw flour. The crunchy topping was so sweet, it almost made my teeth dance. You couldn’t cut a square without it melting into a pile of slick, separated ingredients. What a disappointment. We tried to pretend that the squares were at least somewhat salvageable, but, in the end, we had to toss them out. It was a total disappointment. I couldn’t let things end that way. This was a recipe from Bake Sale, one of my son’s favorite books! We couldn’t let the recipe fail us like that. 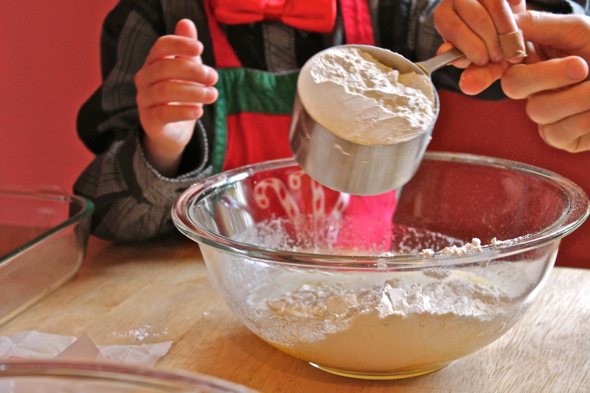 Determined to start anew, I took a look at the original recipe, located a number of red flags, made a number of intuitive changes, and rewrote a plan of baking action that was sure to provide a better result. Ever the trooper, my son agreed to give things another go. The second time, we knocked those raspberry squares out of the park. With a crisp, flaky crust, a crumbly, lightly sweetened topping, and a good balance of toothsome crunch and fruit filling, the raspberry bars were given a new, completely delicious life. 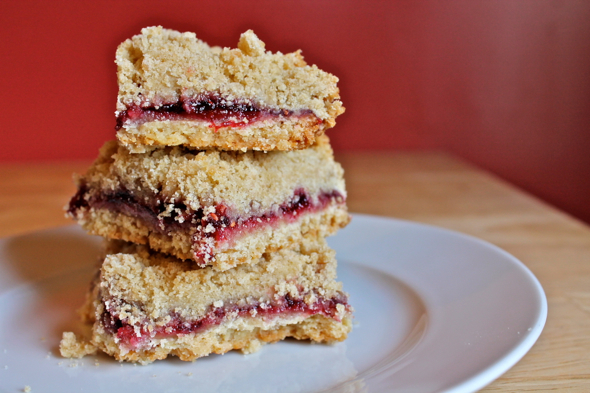 Bake Sale will forever remain one of our most treasured books, and now, revised and edited, these raspberry squares just might make the cut as one of our favorite treats. 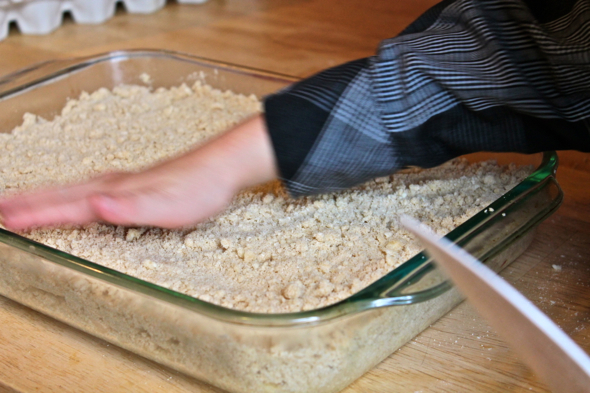 To make the crust, combine butter, brown sugar, flour, and salt in a large bowl. Stir together with a sturdy spoon until the ingredients are incorporated with one another and no streaks of butter show through. Spread dough evenly into a 9’ by 13’ baking dish. 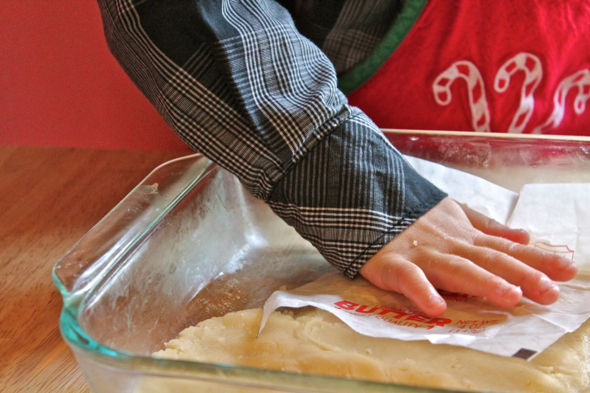 Press down on the dough so it forms a flat and even layer of crust (you can use a piece of wax paper or the wrapper from a stick of butter to do this). Bake crust in center of oven for 17-20 minutes, until the edges are just starting to turn golden brown. Remove from oven and allow to cool completely. While the crust cools, prepare the topping. 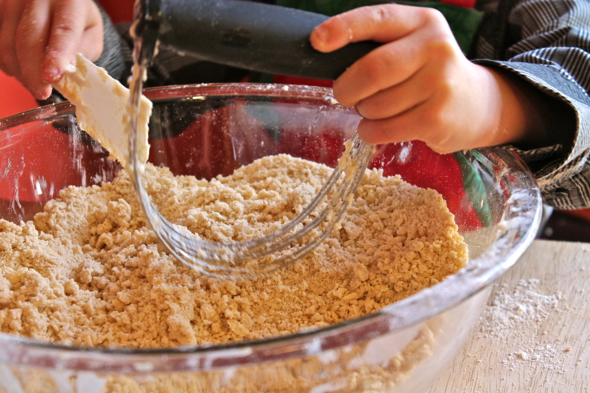 In a large bowl (you can even use the same bowl you used to mix the crust—I promise I won’t tell anyone), mix together the flour, brown sugar, and salt. 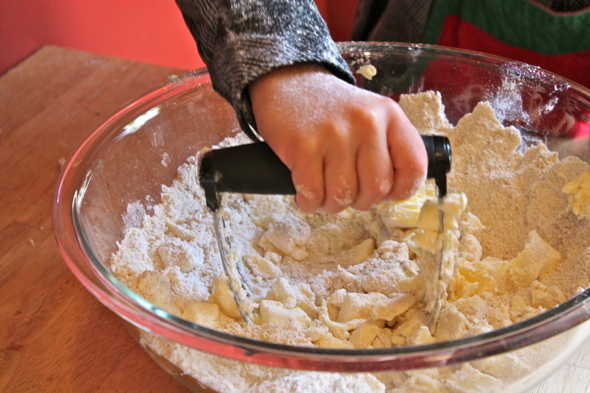 Scatter the butter pieces over the top of the flour mixture. 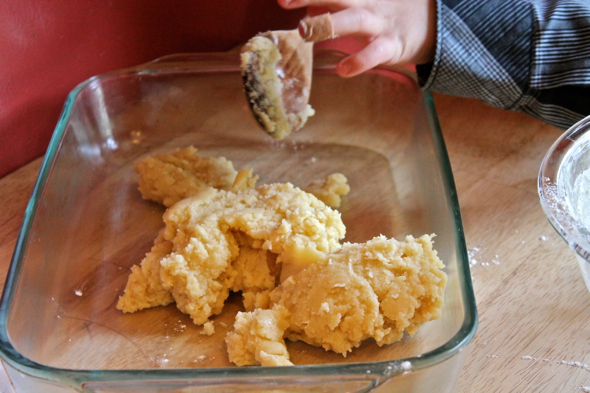 Using a pastry cutter or two knives, cut the butter pieces into the flour mixture until the mixture takes on the appearance of coarse crumbs. 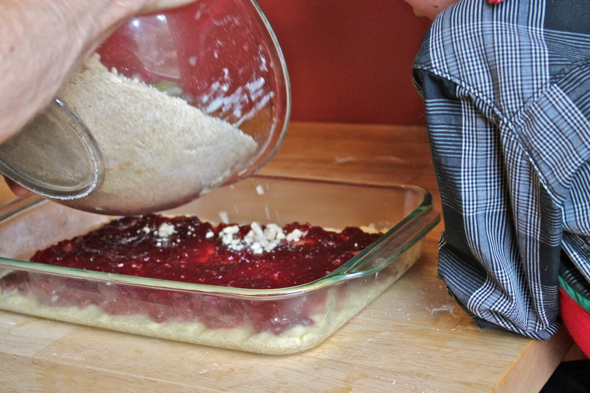 When the crust has cooled, spread the raspberry preserves over the crust, leaving a ¼-inch border around the edges of the crust (if the preserves touch the side of the pan, they will burn during baking). 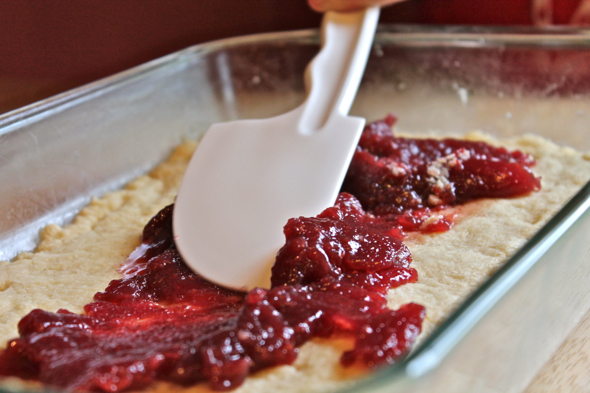 Scatter the crumbly topping evenly over the preserves. Bake in center of oven for 20 to 25 minutes, until topping is light golden brown. 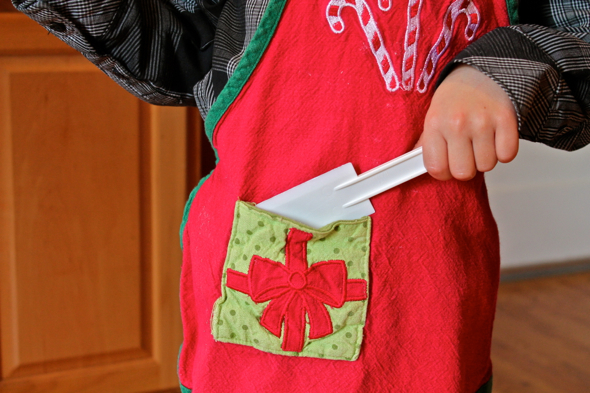 Remove from oven and allow to cool significantly (at least 30 minutes, but preferably 1 hour) before cutting into squares. Depending on how large you make your squares, you can get anywhere from 20 to 32 (or more) squares. Thanks for your loving edits and sharing this lovely story behind the Raspberry Squares. Your son and husband brought these for Thanksgiving and they were delicious! Ah, yes. I had big plans to eat some of these on Thanksgiving. That is, until my stomach let it be known that it had other plans in the works. Ahem.